It is well documented that the rate of adult vaccination in the United States is suboptimal. 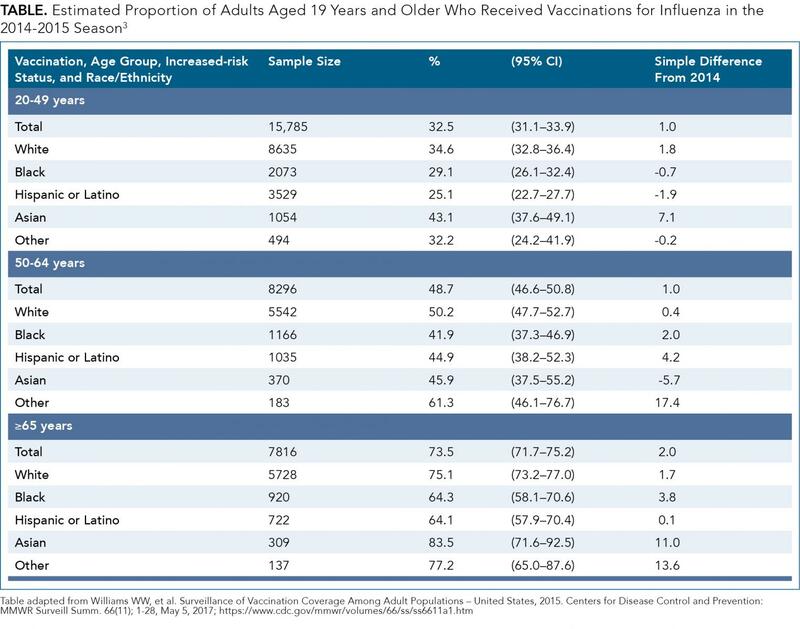 Particularly when compared with childhood vaccination rates, which are often higher than 90%, adult vaccination rates remain low for most vaccines recommended by the Centers for Disease Control and Prevention (CDC).1,2 Stakeholders have been studying this discrepancy, seeking a way to improve compliance with immunization recommendations and patients’ access to vaccinations. Barriers abound to improving adult vaccination rates, from a lack of public awareness regarding the need for vaccines and the ongoing threat of vaccine-preventable diseases, to challenges regard financial/reimbursement systems for providers. Pharmacists are ideally positioned to overcome some of these barriers. Gaps in vaccination coverage are reflected in the statistics for influenza vaccination. In the 2014-2015 season, 32.5% of adults aged 20 to 49 reported receiving the influenza vaccine. The coverage rates improve slightly for the group aged 50 to 64 at 48.7%, and are significantly better in older adults (≥65 years) at 73.5% (Table).3 Looking at early season influenza coverage for 2017-2018, approximately 38% of eligible individuals, in all age groups, had received the vaccination.4 A closer look at vaccination rates for influenza among children ages 6 months through 17 years in the 2015 to 2016 season show decreased coverage with increasing age: aged 6 to 23 months: 75.3%; aged 2 to 4 years: 66.8%; aged 5 to 12 years: 61.8%; and aged 13 to 17 years: 46.8%.5 It is clear from recent surveillance information that efforts to increase influenza vaccination compliance are needed across all age groups. 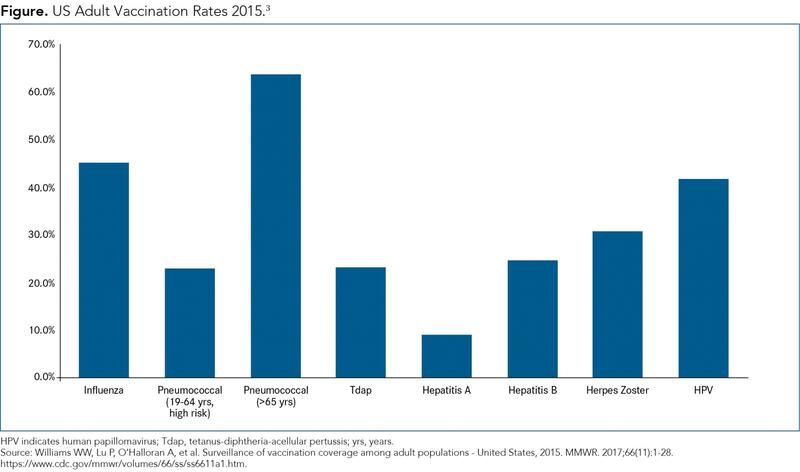 When considering current vaccination recommendations, the above surveillance of vaccine coverage among US adults regarding influenza, pneumococcal disease, tetanus, herpes zoster, and HPV reveals a large opportunity for pharmacist intervention. The above shows how dramatically vaccines are underutilized, particularly among adults and high-risk individuals. To improve the rate of vaccination among adults, communities need to provide more education about and access points for vaccination services. Patients need to know why vaccination is important. This challenge has created widespread interest in the role pharmacists can play in creating and implementing measures aimed at improving the administration of recommended vaccines and, ultimately, stopping vaccine-preventable diseases. What do patients say? They report preferring the convenience of receiving vaccinations in a pharmacy compared with a physician’s office or other traditional environment. In most cases, patients do not have to make an appointment, experience shorter waiting times, and pay nothing out-of-pocket for the visit. Younger, healthier adults in particular—who also have lower immunization rates—seek convenience for their healthcare.6 A pharmacy’s expanded hours translates directly to patients’ increased access to vaccination services. In their reviews of pharmacy-based vaccination’s role in improving adult immunization rates, Bach and Goad note that specific aspects of pharmacists’ training outlined by the Accreditation Council for Pharmacy Education (ACPE) uniquely prepare them to aid in public health efforts.6 Certainly, maximizing the use of pharmacists and pharmacy-based immunization services (PBIS) to increase immunization rates, reach at-risk populations, and decrease the incidences and mortality of vaccine-preventable diseases is an obvious strategy. Pharmacists who administer vaccines must also adhere to a CDC-recognized American Pharmacists Association (APhA) training program that involves 12 hours of self-study, a live 8-hour program, and a practicum covering injection techniques.6 According to the APhA website, there are currently 280,000 pharmacists trained to vaccinate. Although state regulations vary, all 50 states, Puerto Rico, and the District of Columbia allow pharmacists to administer vaccinations. With awareness among adults about needed vaccinations lacking, pharmacists are more than qualified to fill that need. In their interactions with patients, pharmacists can provide up-to-date information about the importance of vaccines and which are recommended. Community pharmacies and pharmacists act as community educators not only by providing literature on vaccinations and where to receive them, but by screening all patients for missing or recommended immunizations.